Control Center is a great feature that brings convenience to iOS. Using it iOS users can easily perform tasks that would require them to perform multiple steps in just a few taps. While Control Center brings accessibility and ease of use for the most part it may become annoying sometimes when you are using some app that involves a lot of swiping or if you don’t want anyone to access your system settings from the lockscreen. Even if you have a passcode on your device anyone can still access the Control Center accessing utilities as well as toggles or WiFi, Bluetooth etc. Turning off access to Control Center from the lockscreen or from within applications is very simple. All you have to do is access the Control Center preferences from the Settings.app and switch a few toggles. Here’s how to disable Control Center on lockscreen and in apps. On your iPhone, iPad or iPod touch open Settings app and look for the ‘Control Center‘ settings. On the next page turn the ‘Access on Lock Screen’ toggle off. This will disable Control Center from the lockscreen. You can turn off access to the Control Center in apps as well, simply turn the ‘Access within Apps’ toggle off. 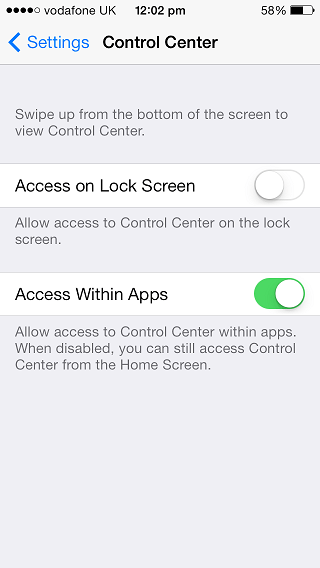 Remember, even if you use both of these settings you can still access the Control Center on the home screen. As of right now there’s no way of turning the Control Center completely off. However if you are jailbroken you can install the ‘NoCC’ tweak from Cydia i.e. available as a free download.